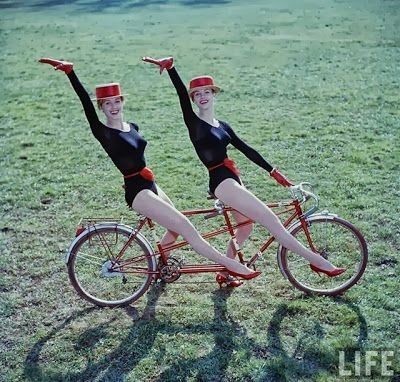 Continuing on the theme from a recent post where two rather (oddly) talented German ladies were seemingly dancing on their rear wheels in perfect unision, here’s another dynamic duo from the past. The outfits are a remarkable fusion of Venetian Gondolier and Robert Palmer film clip. You can’t photoshop this stuff.